This Jewellery Brand Is Bringing A Smile - One Girl At A Time! Brighten your day with these jewellery pieces by Jaanvi Fashion Studio. From jhumkas, sun and moon kemp sets, thread sets, and lightweight earrings, this brand is making every girl smile one day at a time! Jewellery from Jaanvi Fashion Studio is drool-worthy - the kind that you can sport with any kind of outfit and walk out looking and feeling like a diva. They sell different styles - kemp, contemporary stones, German and matt silver, Rudhra choker, and gold finish lightweight jewellery. We like the sun and moon chokers that are designed with pearls. Pair their sun and moon choker with an Indo-Western black dress and you are going to be the showstopper for the party you are heading to. We also absolutely love their Rudraksha necklaces. Look classy in just their thread and rudraksha chain. 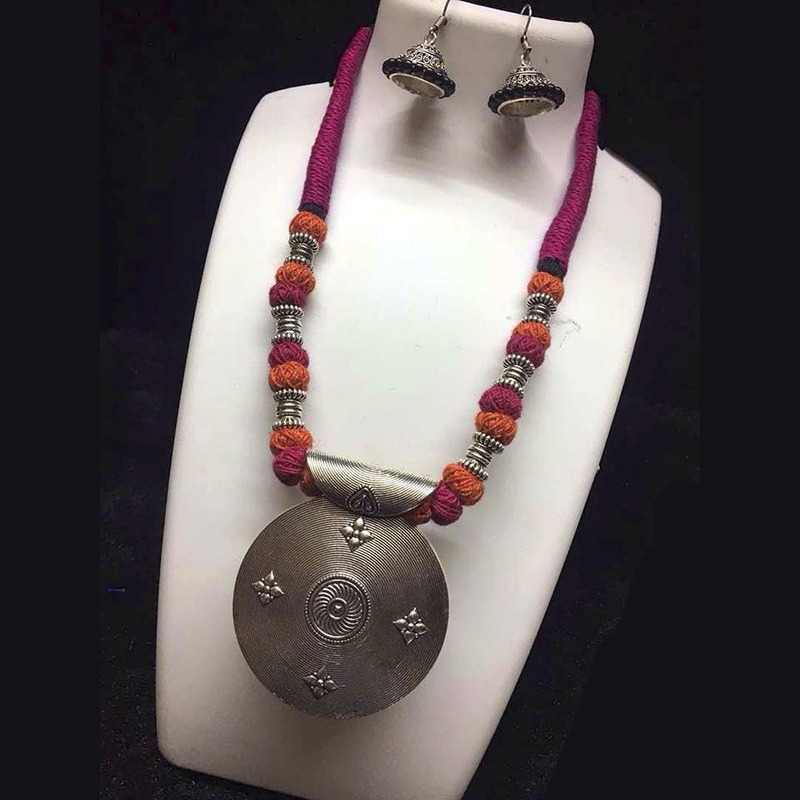 You can also go for their rudraksha kemp set that comes with a chunky necklace and matching earrings. When thread meets silver, what do you get? Necklaces that can't wait to get on to your neck! Besides beautiful jewellery, they also have mogra hair accessories. Tie your hair into a back bun and place the flower set around it. Deepika Padukone feels? If oxidized jewellery or silver is first love, then you will definitely like their leaf necklace that can be paired with any saree. We also like the similar looking tribal triangle design neckpiece. Boho chic in the house! The blue and pink handpainted enamel jhumka is all-things-pretty. But what stole our heart is the three-layer kettle earrings in antique gold. Cutest thing you will see on the internet today! The earrings are priced from INR 250 onwards. They also have bangles made of thread and oxidized silver set.